Plastic Vs Fantastic – Store Bought Or Homemade? I recently got into a debate on the topic of store bought character cakes versus handmade creations from a qualified cake decorator. Where do you stand? Is it OK? Divorce Parties – What Do You Think? This post brings back sad memories. The sound of my drink fountain smashing to the floor as my husband picked it up to throw water on two tweens who had him under attack in a water fight. Ok Ok. I am definitely guilty of preparing too much food at most for my parties. I have this habit of making sure everyone is catered for including vegans, vegetarians and gluten free people. Tonia from The Gunny Sack created these adorable balloon Pinata’s for Easter. The reason I am sharing this is because of her simple but creative method in filling the balloons. Balloon arches may seem outdated but they do have their place. 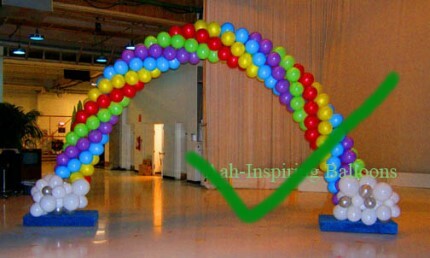 Balloon arches are great for circus party themes anything involving football, Disney, Rainbows, Baby showers and for under 5 year-old parties. inflatable for Big Bird,Bob the Builder or Tinkerbell.